The Vegas Golden Knights might be getting much-needed offensive firepower for their post-season run. According to reports, the team is working towards bringing KHL scoring leader Nikita Gusev over from Russia sometime during the 2019 Stanley Cup playoffs. Head coach Gerard Gallant doesn’t have a clue if or when this possibility will come to fruition. “If he joins us, we’ll see what’s going to happen. Hopefully he does join us and gets some practice time in with us, but I have no idea where that’s going.” said Gallant. 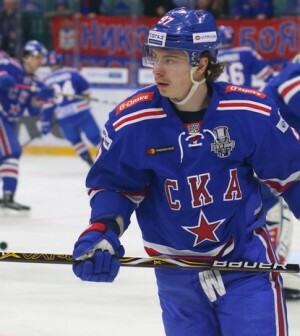 The 26-year old, who was acquired in a trade with the Tampa Bay Lightning during the 2017 NHL Expansion Draft on June 21, 2017, had posted 17 goals and 65 assists in 62 games with SKA Saint Petersburg this past season. He also recorded 19 points in 18 playoff games. Golden Knights lost 5-2 in their first game of their first round playoff series against the San Jose Sharks. They look to even things up tonight for Game 2 at 10:30pm/ET.